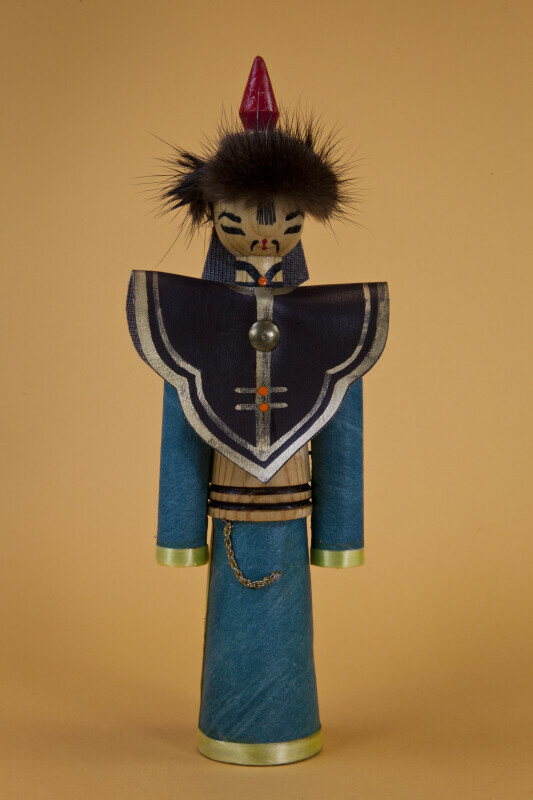 Wooden male figure from Mongolia. The head is a wooden sphere, and the arms made from cylindrical wood. The body is a cone-shaped piece of finished wood. The man's traditional clothes are made from rich brocade cloth, which is glued to the wood. This Mongolian man is wearing a triangular-shaped vest with broad shoulders made from vinyl. He has yellow ribbon as trim on his garment, and there is a gold chain on his pants. On his head, he has a hat with a point that is made from wood. His facial features are painted on the wooden head. The figure is 8 inches (20 cm) tall.